It is the year 2013: Supergiant Games, a small game studio based in San Francisco, California, is showing its forthcoming video game, Transistor, for the very first time at PAX East, a video game convention in Boston, Massachusetts. That was seven commas in one sentence. …That’s more or less how it all started with us and the PS4. And if it sounds a little surreal, I can assure you, it has been. 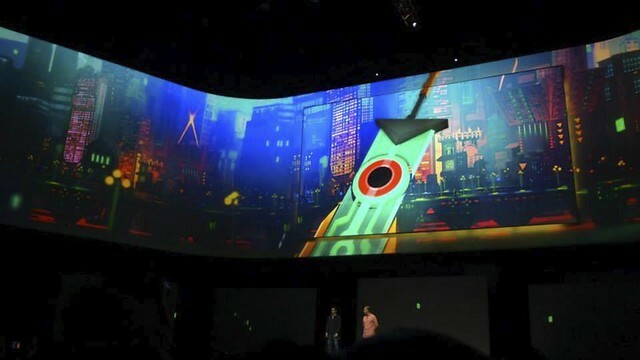 A matter of months after we first revealed Transistor to the world, our studio director Amir and I found ourselves up on stage at Sony’s E3 media briefing, announcing that Transistor would be making its console debut on the PlayStation 4. Then, on May 20th earlier this year, our team delivered. And the response to the game from players around the world has been everything we could have hoped for. We’re grateful to everyone who tried Transistor — it’s always great to hear from you about your experiences with the game. Something else came up in when we first started talking to the folks at Sony about bringing Transistor to PS4: our first game, Bastion. Bastion’s shown incredible staying power for a game originally released in 2011. That year, Bastion earned more than 100 industry accolades, and to date it’s sold more than 3 million copies. But for one reason or another it had never come to PlayStation. We realized maybe it wasn’t too late. That thought lay dormant in our heads, as we focused on making Transistor as best we could. If all went well, we could look into bringing over Bastion afterwards. 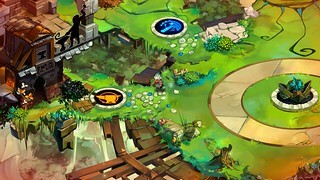 And, here we are, announcing that Bastion’s coming to the PS4 and the PS Vita next year! The PS4 version of Bastion will be playable at the PlayStation Experience event this weekend in Las Vegas, where we’ll be excited to meet many of you and get your impressions. Since Transistor was the first game from our studio to release on a Sony platform, we expect that for many of you, this will be your first opportunity to play the game that made Transistor possible. 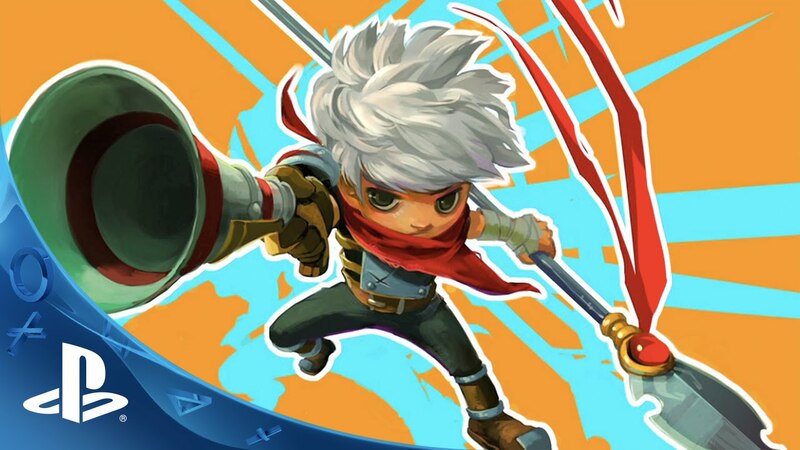 Bastion for PS4 and Vita will support Cross Buy, so if you purchase either, you’ll be getting both those versions of the game. We’re looking into supporting Cross Save, where your saved data transfers seamlessly between devices. We’re working with the team at BlitWorks to create these new versions of the game. BlitWorks is behind great PS4 and Vita translations of great games like Spelunky and FEZ, and we couldn’t be more impressed with the work they’ve done so far. If you’ve played Transistor before, you’ll find that Bastion was created with the same set of values: It’s a game you can pick up and start playing immediately, designed to draw you in with rich atmospheric storytelling and tight responsive gameplay. Other than that, though, the experience of Bastion is very different — an action role-playing game with an emphasis on the action, and whose reactive narration system makes for a memorable and personal tale. Here at Supergiant, Bastion will always hold a special place in our hearts. We hope it can do the same for you. Ah, that’s great! I haven’t played the PC release despite owning it, so I will try it out on my Vita. I hope Cross-Save is supported at release. I can’t believe it. This is awesome. I have a PS4, but I will be playing it on my Vita. Sounds like a fun time on the Vita =D Thanks guys! awesome! so glad to see this coming to Vita, especially! I just don’t like playing many games on iPad because of all the ads and in-app purchases (not that Bastion did that). the Fez port to PS3/4 supported 3DTVs, will Bastion also support 3DTV on PS4? Hey we don’t have plans for 3DTV support at the moment though we haven’t necessarily ruled anything out…! Thanks for your interest in this. 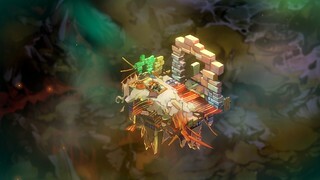 Excited for a Vita version of Bastion here too. The portable nature makes the narration feel even more personal somehow than on a big screen. Purchased this on steam months ago…since I thought this will never come on Console. Thanks, will pick it up for the Vita..
Oh my god, THANK YOU SO MUCH. I’ll buy it, day one. Pinky swear and everything. This game makes perfect sense on the Vita, thank you WB, for supporting the handheld. Also, I hope the PSVita edition is no different than the console one. Looking at the screenshots reminds me of Pavilion on Vita, not sure why. Seriously? now? I already played it on PC years ago!!! is a great game though, but I may won’t buy this again, if this comes out earlier I definitely will buy it, because is a perfect fit for PSV. But is too late now. But I will consider to get PSv version if it has so improvement amount the pc, dlc or something could be awesome. I loved Bastion on Steam and Transistor on PS4! I swore that if this came to PS4 I would buy it and I stand by that. The fact that you made it cross buy is even better! Day 1 for me. Right on…! For sure the ongoing interest in seeing Bastion come to PlayStation platforms factored into our decision to make it happen, so thank you for your support! Good news, but Transistor on Vita would be much more desirable at this point. Transistor was great and this one looks just as promising. I’m hoping for a release during the summer drought when there are no AAA games coming out. Bought but never finished on the PC. Guess they will take my money again, and I will be glad of it. Bring home the Vita love! I may need to order a second 64GB memory card soon. Great, now maybe I’ll pick up Transistor. Owned an Xbox 360 but never got around to trying this game out. After all of the accolades I will give it a shot for sure this time around. Yeah! I’ve been waiting for this announcement for a long time now. I own Bastion on PC, but I don’t own a gaming PC myself (I’ve used office-issued powerful laptops, but not mine so yeah), so this is a good thing. Amazing game. I have listened to the soundtrack countless times.